If you have a college student in your life, August is a time of transition. Summer is ending and that means it’s time to get packing for school. Whether your student is starting their college career or returning from summer break, there’s a lot of organizing to do in a short amount of time. If you’re pulling your items out of storage or moving in for the first time, you want to make the most out of a limited amount of space. Box&Co is dedicated to helping clients stay organized and making storage simple, so we want to give you some tips about storage and organization as we start the new college term. If you’re looking to put together a dorm room, one great resource is from students themselves. At the University of Indiana, the student newspaper the Indiana Daily Student gives some ideas on what to pack and what not to pack. With limited space, it’s probably not a good idea to pack too many clothes. If you’re moving back in, you might want to look into swapping out clothes from last term into storage and swapping in what you need for fall and winter. At the very least, consider swapping your summer and fall clothes for winter and spring clothes when you go home for Thanksgiving. Another thing to make certain is not to pack anything you’re not allowed to bring. NBC News says that you should check the college website to see if items like coffeemakers, hot plates, kettles, and extension cords are banned. You can also pick up some tips that will make your move easier. The website may contain information about where to park, student volunteers who can help or where to find containers and carts. As for what to pack, try to anticipate everything you might need and try to make things easy. The Daily Student suggests laundry detergent pods are an easy product for students who may not be used to doing laundry. You should also bring things that give you extra storage space. If you can, put in multi-purpose furniture that contain storage cubes. Or use small plastic dressers or hanging shelves. You can make the room more functional and decorative by using sticky hooks to put up whiteboards, bulletin boards or artwork. Because space is at a premium, there are some cheats you can use to create extra space. For example, BuzzFeed suggests hanging soda can tabs off your closet hangers to hang a second hanger up in the same place. Or you can use an over the door shoe organizer as extra storage space for snacks. Just shove a couple of packs of candy where you’d usually stick a pair of sneakers. And bring plenty of plastic storage bins. They’ll give you extra space if the dorm room doesn’t provide you with extra drawer space. If you’re looking to find extra storage for college students, Box&Co can make it easier for you. We offer packages which include drop-off of storage containers, pick-up and delivery of stored items back to your school. We also offer discounted prices for students. To learn more, contact us today. 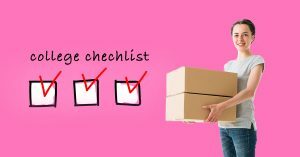 This article lists tips and tricks for packing to go away to college and how to get your college dorm room organized when space is at a premium.